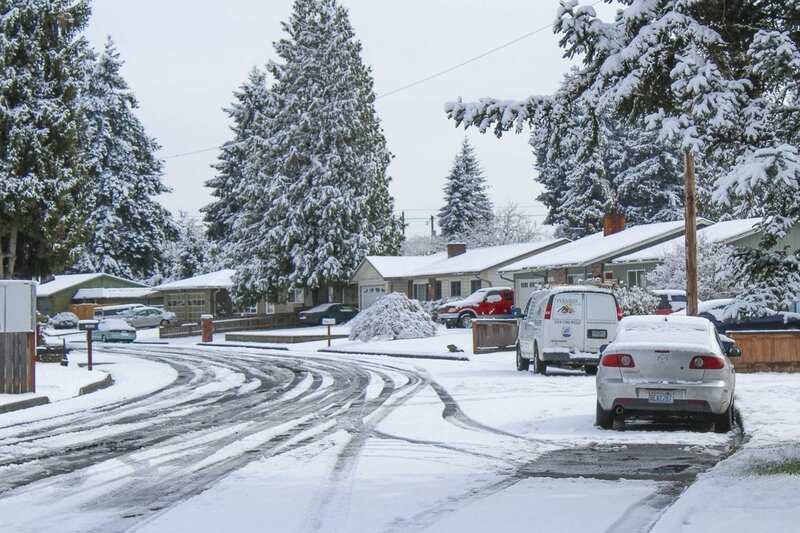 VANCOUVER — With snow falling Tuesday and more expected overnight Wednesday, Clark County Public Works is rearranging schedules for road crews to provide around-the-clock response. Crews were out Monday and early Tuesday morning pretreating county roads with saline anti-icer, a mix of salt and water, which inhibits ice crystals from bonding to pavement. Areas currently experiencing the most snow and ice are at higher elevations, 500 feet or more above sea level. In other areas, there is wet pavement and not enough snow to plow. However, with the upcoming forecast calling for up to 7 inches, crews are fully prepared and ready to respond. Public Works will continue to adjust its staffing plans based on the latest weather forecasts and on-the-ground conditions. Road crews will be prepared to plow roads and spread gravel on curves, hills and other trouble spots where drivers can use more traction. “We will deliver whatever response is needed to help our residents get through this late-season snowfall,” said Scott Wilson, Road Maintenance and Safety Division manager. Residents are urged to plan ahead and travel only if necessary. Also, drivers are urged to slow down and allow extra travel time. If there is major snow accumulation, drivers should watch for children playing in the snow or pedestrians walking in the street because of snow-covered sidewalks. Clark County has almost 100 traffic cameras at signalized intersections, primarily in the urban area outside the city of Vancouver. The cameras, which can be accessed at https://www.clark.wa.gov/public-works/traffic-cameras, provide a handy way for residents to check out current conditions at specific locations before leaving home. Fallen trees or limbs blocking county roads and other problems can be reported to Public Works at (360) 397-2446. Downed power lines should be reported to Clark Public Utilities at (360) 992-8000. Reports can also be made via the mobile-friendly website: www.clarkpublicutilities.com. More information on the county’s winter weather preparation and response is available on the county’s website at https://www.clark.wa.gov/public-works/winter-snow-and-ice. Information provided by Clark County Communications.